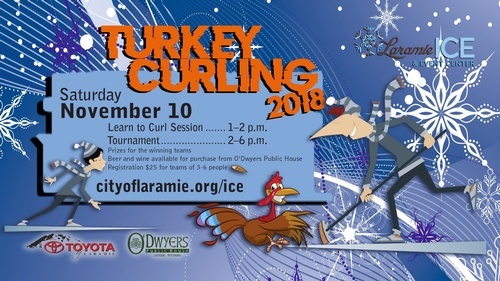 We hope you will join us on Saturday, November 10th for the 2018 Turkey Curling Tournament sponsored by Toyota of Laramie and O'Dwyers Public House!!! This event is a food drive to collect non-perishable food donations. All of the Turkeys and food raised will be donated to benefit the Laramie Community Thanksgiving Dinner. What is Turkey Curling? Well, its just like curling but instead of stones we use Turkeys! Turkeys are wrapped to preserve them for later use and participants take turns curling them down the ice! Prizes will be awarded to the team with the best costume and the team who wins the tournament! Grab your friends and join us for this great community event!